Because the High Line is excellent, and startlingly unique. You see New York City in a whole different way when you are walking 30 feet in the air. There are lovely views of the river, but it is really the city that entices from this vantage point. New vistas open up and, without all that ground-floor retail screaming for your attention, you see the forms of buildings. When people in architectural circles started talking about converting the old elevated rail line into a park more than 10 years ago, I was skeptical. It sounded rickety and remote. Unless you’re heading to the Javits or Hoboken, why would you go that far west? The idea of using the native plants seemed even stranger. How pretty could a bunch of scraggly wild trees and weeds be? I was wrong on all counts. 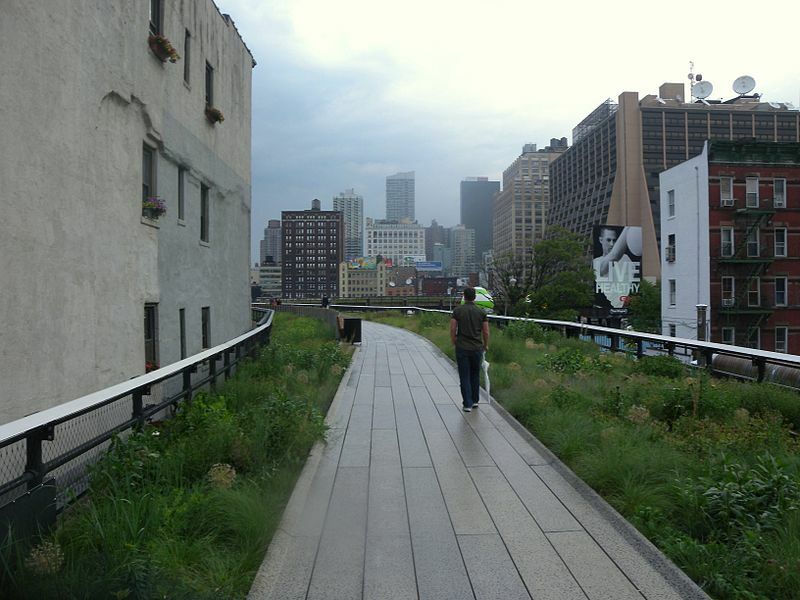 First, the High Line is doing much to stimulate that edge of the city and make it a destination. From the vantage point of the High Line you get a sense of how many new apartments are fronting this iron aerie. And with apartments come restaurants, stores, and nightlife. There is much to explore. And there is nothing rickety or rusty about the former elevated rail line. During the renovation, the structure, which was pretty sturdy to begin with, was shored up, scraped and painted. This airborne park is carefully landscaped with indigenous plants and flowers–which begs the question: At what point does a plant become a weed? It is a haven for birds. Okay, that includes pigeons, but there are other winged creatures too. Best of all, the High Line has become a gathering spot for so many activities that were once the purview of Central Park. A star-gazing group meets on Tuesday nights. There is a monthly bloom guide so you can track the progress of flowers. Casual groups meet to walk the mile-long path every day. There is a small outdoor venue for music and theater. There are art exhibitions, tours, talks, and events for children. This former eyesore is a happening place. 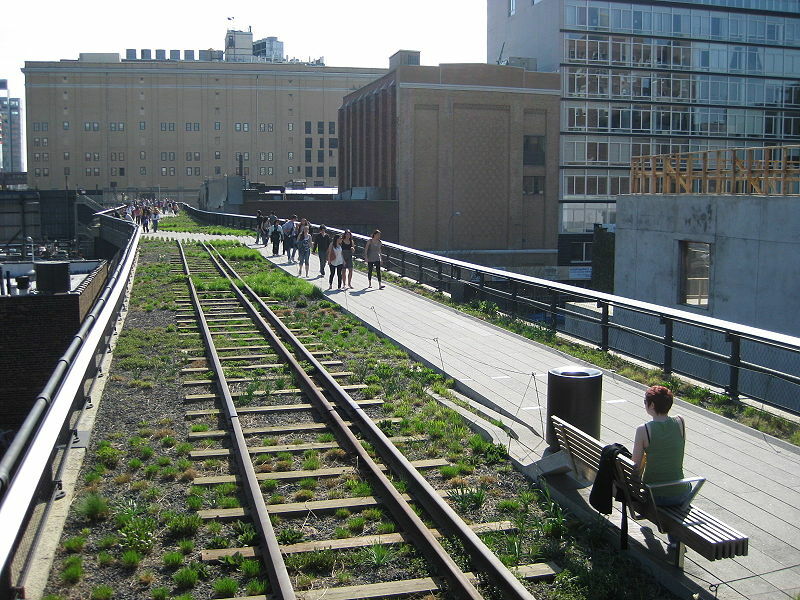 The idea of preserving the High Line dates back to 1999 when a group of residents, preservationists, and history enthusiasts got together and said, under threat of demolition, “Wait!” To the city’s credit they waited and the group, which became Friends of the High Line, started working on ideas. It was the design team of landscape architects James Corner Field Operations, with architectsDiller Scofidio + Renfro, that envisioned the High Line as it stands. The original structure was built in the 1930s to lift trains from the streets, thus preserving the safety of pedestrians. The last of these trains rattled down the line in 1980. Construction of the park began in 2006 and the completed portion stretches from Gansevoort Street to West 30th Street. There’s more to come. 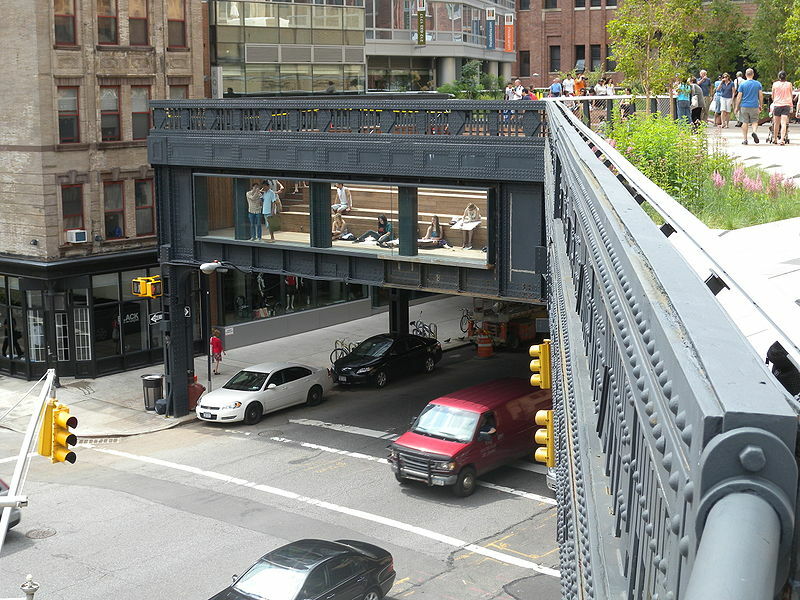 Ultimately the High Line will stretch northwest to 34th Street and 12th Avenue. Start enjoying it now.